Watching players’ feet while they are taking throw-ins is a potential breach of law that seems to be overlooked these days. It used to be standard practice that the referee would check the players’ arms and the AR, their feet. In the clip below, the AR’s gaze of focus is infield, totally ignoring the thrower’s feet. It appears to be a foul throw and a goal results from the forthcoming play. So why is the practice of checking the feet almost obsolete? In my opinion, it’s due to a couple of reasons. Firstly, the AR’s focus is where the next phase of play is likely to be and he does not want to miss a foul or an offside. I would suggest that it only takes a split second to momentarily glance at the feet before reverting back to the field of play. Secondly, foul throws very rarely happen and so they don’t believe it is worth even checking. I would say that it is still worth checking, even if it prevents one illegal foul throw a season that results in a controversial goal and, as explained earlier, it is so simple to monitor. When such an obvious handball occurs in the penalty area it is vital that if the referee misses it, then the AR must see it and act accordingly. The AR’s primary function and responsibility has to be offside and then ball in and out of play. When there is little possibility of the ball going out of play or an offside call then the AR can fully focus using heightened awareness on other on-field incidents that occur when the referee does not see or recognize the incident. In this case neither referee nor AR see the deliberate handball and the Union are denied a clear PK. In this case there is also an issue with the sun in the AR’s eyes. That being the case, the AR has to adapt to weather conditions accordingly and if this means at vital times he uses his spare hand to shield the sun from his eyes, then that is what he should do. This is a very interesting and debatable offside situation where you would split the room in a debate. It illustrates how contentious and, more importantly, how difficult it is for both referee and AR to judge in real time. You have to judge whether the offside player challenges the keeper for the ball or is he clearly obstructing his line of vision. Having viewed this clip several times I support the match officials in not penalizing for offside due to the fact that, at the moment the ball is played, the goalkeeper can clearly see the ball. He then makes a save just as the offside player is coming close to him and in his line of vision. So is he clearly obstructing his line of vision? I would say not. And is he challenging him for the ball? I would say that as the forward does not attempt to play the ball and, in fact, he clearly avoids playing the ball, again I would say not. I would be interested in anyone else’s views. It is of vital importance that ARs maintain concentration and keep awareness of all players’ movements when making offside calls. In this particular play, a player’s momentum takes him off the field of play behind the goal line. The player re-enters the field of play, interferes with the ball, and a goal almost results. This was a missed offside by the AR who should be keeping him in his sight and thoughts and penalize him for being offside as soon as he played the ball. If the two defenders who were initially located between the posts had remained on the goal line then they would have played the forward onside as behind the goal line is regarded as on the goal line. In this incident there is a player in an offside position. He does not interfere with an opponent and it is unclear whether he has interfered with play by actually playing the ball, or whether the ball goes straight into the goal without him touching it. That is the dilemma the AR is in when he has to make this vital call. Sometimes without guessing you can utilize all the clues that are presented to you. Players naturally love scoring goals and gaining the credit for it. So on this occasion when he starts his celebration he is guilty as charged. There is no question in my opinion that the concentration level of an AR has to be far higher than a referee. The heightened awareness that an AR has to possess when the ball is played through, when there are some forwards onside and some in offside positions, demonstrates this point. In this game, the AR has two occasions when he has to utilize the ‘wait and see’ technique and keep his flag down until he knows the outcome. ARs have to be aware of the exact moment the ball is played, who has played it, and take a picture of all the players in and around the offside line. They then have to track all the players’ movements, both attackers and defenders, before making a call. The timing is vitally important; they cannot raise their flag too early, only when an offense has been committed. Their positioning is also important as they must ensure they are in the optimum position to make the judgment. In these examples the AR demonstrates all these necessary attributes to arrive at the correct decision. As discussed previously, there are moments when referees have part of the information and the AR has the other part. This is called a ‘jigsaw’ situation and it is vital that they have dialogue to enable them to arrive at the correct decision. Here, the referee awards a PK and then the AR signals for offside. The problem in this particular play is that the referee is unaware of the exact moment the AR signaled and the AR is unaware of the PK award as he cannot see because his vision is blocked by a number of players. 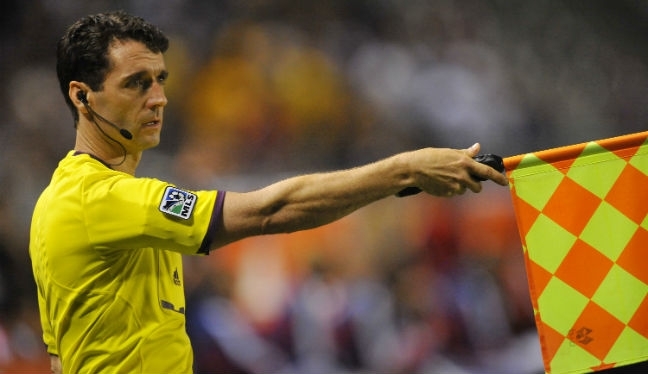 The referee is forced to make a call one way or another – PK or offside? The key is obviously which came first. Unfortunately, the referee decides to penalize the offside when it is clear that the PK happened first. This is when a strategy can be worked out between the referee and the assistants prior to the game, when an AR can inform the referee over the communication kit of the exact moment that the offside offense occurred. The referee will then be aware instantly whether he has already awarded the PK, and arrive at the correct call, which in this case would have been the PK. We have mentioned the importance of dialogue between the referee and AR on many occasions but what happens when there is simply no time to have that conversation? In Philadelphia Union versus New England Revolution, the AR can see that there is a player in an offside position but is unsure whether the ball has been played to him by a team-mate or a defender. If the ball goes into the goal or out of play for a corner kick it then becomes an appropriate time to have that dialogue but, on this occasion, play continues quickly. There is no time for dialogue and the player in the offside position almost scores. The question is: Should the AR raise his flag if unsure or not? If the AR is unsure he should try and ask the referee quickly but in this case play moves on very quickly and a goal is not scored. We always encourage ARs not to guess and, if they are unsure, why raise the flag and potentially have the game stopped unnecessarily? I would advocate that if the ball goes out of play for a goal kick or is cleared away and is in the possession of the defending team, allow play to continue. However, if a goal, corner kick, PK or free kick to the attacking team results, then it is time to have meaningful dialogue. It is crucial that ARs are in the optimum position when they are called upon to make an offside decision and not lose focus on the second last defender. In the case above, following a corner kick, the AR seems ‘frozen’ to the goal line and cannot possibly judge whether the goal scorer is in an onside position when the ball is played to him. On this occasion he is lucky as the decision is correct. Due to the quick changing positions of the defenders in Houston Dynamo versus Colorado Rapids, the AR has problems in keeping level with the second last defender. Therefore, when the ball is played he is not in the optimum position to make his judgment – he is not in line and has a distorted view of the position of the forward in relation to the defenders. Consequently he makes an incorrect call and the forward is penalized for an offside offense when he was in fact onside. ARs have to be 100 per cent sure that the ball has wholly crossed the goal line before committing themselves to indicating for a goal kick or corner kick. It is important that they never guess. If we look at this clip from New York Red Bulls versus San Jose Earthquakes, the AR adjudicates that the ball is out but how can he know? The goalkeeper has caught the ball with his back to the AR and therefore it is impossible for the AR to see if the ball is over the goal line. You can never be criticized for not giving something you can’t see but you can be held accountable for guessing and making a call that simply didn’t happen. Referees have to appreciate that when the play is in front of their AR they have to take responsibility for the potential of foul challenges. ARs have primary considerations for offside and ball in and out of play. In the above incident the AR is fully focused on the ball as that is his priority at that particular moment – he needs to decide who last played the ball and make a call; whether it is throw-in, goal kick or corner kick. There is a blatant push directly in front of the AR which he cannot see. This is when referees can have the tendency to switch off and leave all the responsibility to the AR. It resulted in the AR making a throw-in call and the referee, due to him not being fully focused but sensing that there was a foul challenge, eventually awarding the free kick the wrong way. We are holding an AR Camp over the weekend of June 13th where we will be working on drills and discussions that will cover the above attributes. The very top officials will know that they reach the summit through practice, practice, practice, and they maintain their position at the top by even more practice. The technique and offside decision-making skills that we see every week in the MLS leaves me in no doubt that our ARs rate amongst the best in the world. I look forward to seeing more impressive performances during 2015.